Wedding ceremony in Phuket is a beautiful wedding celebration with a photo session, impressions and with the loved ones surrounding you. But it can be made even more creative and stylish. WE OFFER YOU A HONEYMOON ON A YACHT! 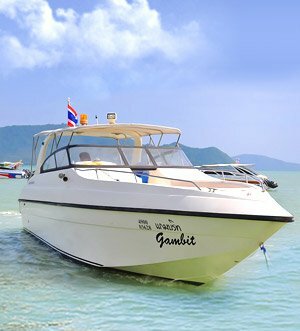 You will spend your time a yacht in the waters of the Andaman Sea, have a great photo session and buffet with music which brings bright sunny mood. 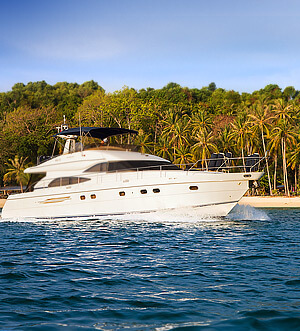 At the same time you can organize a wedding ceremony, both on the yacht itself, and on the island of Phuket or any uninhabited island that you’d like! The entire route of your voyage will be chosen individually for you and your friends. 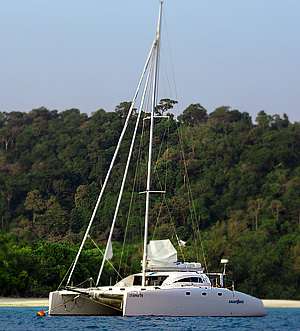 Depending on the number of guests and your budget, you can choose among different boats: it can be a motor catamaran, a sailing yacht or a speedboat. Do you want to have a two-day voyage? We are at your service! We will take you to the paradise island, where you will book rooms for you and your guests. On the second day, you can organize an active holiday with diving, wakeboard, underwater hunting or fishing. It’s ideal! Wedding ceremony in Phuket will be an adventure with its own unique theme. And most importantly, it’s cheaper than you expect it to be! You can rent a speedboat where a small clique, accompanied by a photographer and a ceremony master can go to a beautiful, thinly populated island which is nearby. All of that will cost you less than $1000. We can organize a luxurious ceremony with a banquet and disco on a huge luxury yacht to celebrate a large-scale holiday. You can go on a yacht together alone, while we will organize everything for you a romantic dinner on an uninhabited island. Just imagine: a warm, starry night, and you two on a yacht with a glass of aromatic wine. What could be more romantic? Leave your phone number or e-mail, our manager will contact you and you will choose the most optimal option for an unforgettable holiday.